Increased awareness by customers when it comes to the environment and floor care, is happening around the Globe. For those people who have mild to serious allergies and care about environments and floor care for their homes or business; Clay Floors insists on using Bona products. Why, because Bona leads the pack. Bona Green is our product focus this month for Keith Clay Floors. Education about floors, types of flooring, our services, and green products we use on a daily basis will give you peace of mind when it comes to selecting a great contractor to handly all your flooring needs. Bona has been in business for over 100 years, and continues to be a world leader in products green or otherwise. This article will feature Clay Floors using Bona Free & Simple® Hardwood Floor Cleaner. This product is now Certified asthma & allergy friendly™ by the Asthma and Allergy Foundation of America (AAFA). This wonderful new formula offers an effective floor cleaning solution that helps reduce allergens and irritants that accumulate on your floors and helps you understand the great benefits to you and your family. Free of dyes and scents, this ready-to-use cleaner is safe for your family and wood floors. 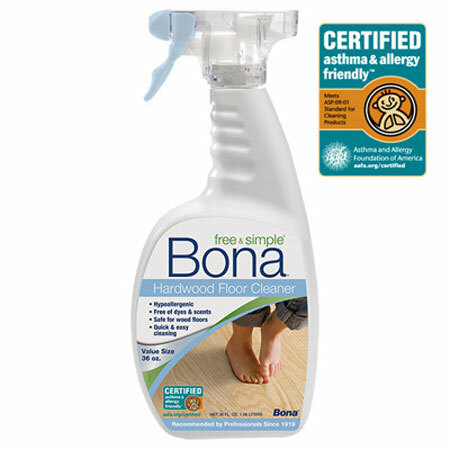 Bona was also the first manufacturer in the industry to offer a complete hardwood floor finishing and care system that is GREENGUARD Gold Certified. Clay Floors has discussed this product many times over the years, and this certification assures professionals and consumers unsurpassed durability, beauty and environmental responsibility for hardwood floors from sanding and finishing to floor care. That is what we are all about! Bona waterborne floor cleaners are safe for families, floors and the environment. Bona utilizes the most environmentally friendly raw materials to eliminate harmful effects towards the environment to achieve stringent certifications through third-party organizations, such as GREENGUARD and the Asthma and Allergy Foundation of America. Bona waterborne finishes have limited toxic fumes and low VOC’s so they are healthier for your family, pets, and the environment. In addition, there is no need to vacate your home during the finishing process due to fast dry times and easy water clean-up. This Swedish waterborne technology highlights the true beauty and elegance of the wood and provides the ultimate in durability. Bona’s trailer-mounted Bona Atomic Dust Containment System is the most forward thinking innovation in the industry and the world. The powerful system evacuates airborne dust generated by the sanding process. It virtually eliminates lingering dust in your air-ducts and a clean-up dust storm headache that feels like it will never end. At Bona, they also reuse materials within our own production and also design our products to reduce landfill clutter. Bona Microfiber Cleaning Pads are machine washable up to 300 times, saving you money and protecting our shared environment. Asthma and Allergy Foundation of America – AAFA, a not-for-profit organization founded in 1953, is the leading patient organization for people with asthma and allergies, and the oldest asthma and allergy patient group in the world. AAFA provides practical information, community based services and support to people through a network of Regional Chapters, Support Groups and other Local Partners around the U.S. AAFA develops health education, organizes state and national advocacy efforts and funds research to find better treatments and cures. In addition, the mission of AAFA’s Web site is to provide online access to AAFA’s reliable, validated asthma and allergy information and tools to families, patients, parents, healthcare providers, policymakers and others. GREENGUARD – Bona’s floor care products are GREENGUARD Gold Certified. GREENGUARD is a non-profit, third party organization that tests indoor products for their environmental impact in an effort to improve the air quality consumers breathe. GREENGUARD Gold Certification offers stricter certification criteria, considers safety factors to account for sensitive individuals (such as children and the elderly) and ensures that a product is acceptable for use in environments such as schools and healthcare facilities. It is referenced by both The Collaborative for High Performance Schools (CHPS) and the Leadership in Energy and Environmental Design (LEED) Building Rating System. Keith Clay Floors uses GREENGUARD Certified Products in the installation and maintenance of many types of hardwood floors, coatings, cleaning products, and dust-collection equipment. Keith Clay Floors believes that it is great to use strong consumer brands like the Bona Systems and Basic Coatings who recognize the importance of providing better products for indoor environments. Bona Residential Products – For over 30 years, Keith Clay Floors has recognized consumers growing desire for ‘green’ products and has made sure that clients like you have healthy products for their indoor environments. Keith Clay Floors is very happy to be playing an active role in using participating manufacturers in the GREENGUARD Certification Program. There are many other types of consumer products certified by GREENGUARD, and we hope you will visit their website and obtain a copy of the free product guide at GreenGuard.org . Keith Clay has been in business for almost 30 years serving Dallas, Frisco, Plano, Richardson and all Dallas Metroplex suburbs. We know wood floors and can answer any questions you may have. If you want the best job from a company of professionals, call us today. 972-463-6604. World Class Craftsmanship. Reasonable Prices.